I'm speechless here. WTF is this? One could assume it's a simple "America, F@#$% Yeah!" perversion, but this goes beyond that, deep into the realm of a troubled human psyche. Either that, or someone's meth lab is booming (not in the bad way). This is not an ugly truck; it's a rolling abomination. But then again, diff'rent strokes for diff'rent folks. 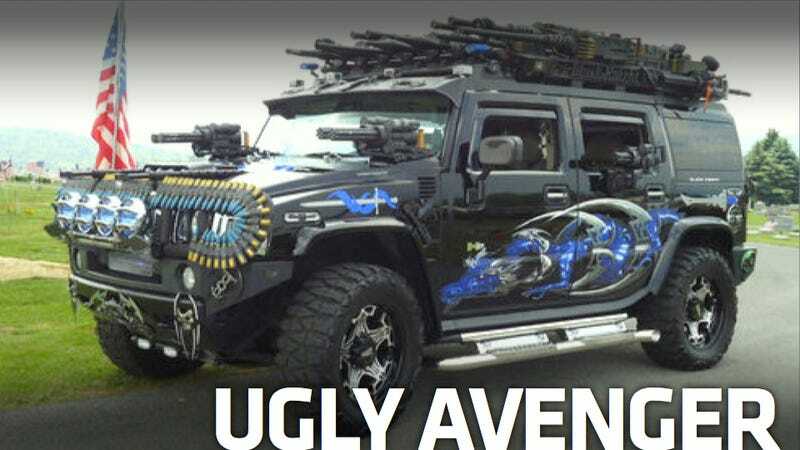 Perhaps 20mm shell grille trim and more guns than a National Guard armory tickles your funny bone in just the right way. If that's the case, this gem of an H2 is for sale, as is, bristling with (hopefully non-functional) automatic weaponry. All for the low, low price of $55,000. But don't take it from me, the seller really knows his stuff on this mini armageddon on wheels. This is a real head turner! Lambo doors front and rear. 7- MA Deuce 50 Caliber Machine Guns with Tripods, 2- 30 Caliber M1919 Machine Guns, 10- Mini-Guns with Rotating Action, 4- RPG's Rocket Propelled Grenade Launchers, 20mm Real Shells on Front Brush Guard and on Back Spare Tire, 50 Caliber on Top Shoots Simulated Fire with Loud Report and Works with Propane/ Oxygen Tanks Stored in Ammo Cases on Roof. But wait, there's more, and it reads like the wishlist of an ADD afflicted meth addict. If you can't find the gun you're looking for (which isn't likely, because there are a few machine guns and grenade launcher in the back seat, too), you have your pick of two, roof-mounted Final Fantasy Swords. Yeah! Or, check out this awesome video, brought to you from Johnstown, Pa.
Also, let's please not forget the interior laser light show, subwoofers, hand grenade shifter, and the assortment of rad dragon and skull decals. Y'know, just in case you ever wanted to go to war in a night club.